Harrogate Automation Ltd, specialises in the design, installation and automation of bespoke aluminium gates for homeowners and businesses across Harrogate and the North Yorkshire region. Each and every gate we install has been tailored to our client’s exact specification. We provide personal, one to one, consultation, at every stage of the project, to ensure that we can deliver exactly what the client ordered and tailor the solution to our client’s specific needs. We assure the best results for our customers by only using the safest and most reliable products available. We take pride in the quality of our installations. Our engineers are very experienced, highly skilled and have an detailed knowledge of our products, their installation and the industry. 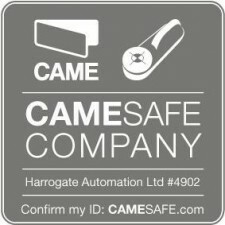 Harrogate Automation has achieved CAMESAFE installer status to give you confidence that what you will receive will be both high quality and safe. We have chosen to specialise in Aluminium gates because they have so many advantages over traditional wrought-iron and wooden gates. They are versatile in design and finish. Before you install a new wrought-iron or wooden gate take a look at the range of aluminium gates we offer. All gates can be given a range of authentic finishes to look just like the real thing. We specialise particularly in the installation of Knotwood and Wralloy™ gates as well as our premier range of horiz-Al gates. For full details about these gates and our other products please visit our services page. As well as new installations we can provide automation solutions for your existing gates or upgrade your old system. Harrogate Automation provides professional servicing, maintenance and repair services to both existing and new customers. In addition to work for private clients and businesses, we are able to offer a range of services and support to professional designers and contractors.